Raising agricultural exports requires the government to unburden policy of consumer bias. A balance should be struck between meeting the needs of food-insecure consumers and income-insecure farmers. It is not just price competitiveness that restricts our exports; the biggest hurdle comes from uncertain domestic marketing and trade policies. The Agriculture Minister, Radha Mohan Singh, recently tweeted about the government’s resolve to increase the value of the country’s agricultural exports to $100 billion by 2022-23. The Dalwai Committee Report on doubling farmers’ incomes also talked of a similar target. It said, “the aim should be to raise agricultural exports by a minimum of three times by 2022-23, to reach the target of $100 billion”. Interestingly, the draft Agricultural Export Policy, that has been put in the public domain by the Minister of Commerce, has a much more modest target — $60 billion by 2022-23. When two Union ministries talk of vastly different goals for agri-exports, one wonders which ministry should one believe. One also wonders which ministry is actually responsible for attaining the concerned target. The different targets also reflect a disconnect within the government and show inter-ministerial coordination in poor light. In any case, it is worth noting that when the UPA held office, India’s agri-exports grew five times: From $8.7 billion in 2004-05 to $42.6 billion by 2013-14. This was an unprecedented achievement in independent India’s history. 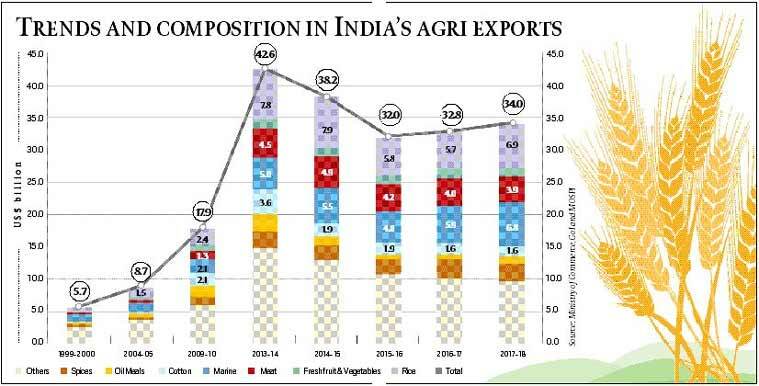 Not only this, India’s net agri-export surplus (exports minus imports) increased from $3.7 billion in 2004-05 to about $27 billion in 2013-14; that was a more than a seven-fold increase. However, in 2014-16, India’s agri-exports fell to $32 billion. They rose marginally to $33 billion in 2016-17 (see graph). The net trade surplus fell to $9.5 billion in 2015-16 and further to $7.8 billion in 2016-17. The April-February data for 2017-18 shows agri-exports at $34 billion; this is likely to go up to about $38 billion once we have figures for the entire financial year. Thus, the real challenge for the Narendra Modi government is to first engineer recovery of agri-trade to the 2013-14 levels. Besides, the target of $60 billion by 2022-23 is less than a 50 per cent increase over a nine-year period — from 2013-14 to 2022-23. The target of $100 billion is surely bolder. In a global economy that is highly price- and quality-sensitive, what should be the strategy to double or triple Indian agri-exports by 2022-23? The draft Agri-Exports Policy rightly identifies two steps: Identify commodities in which India holds a global comparative advantage and develop clusters in states to create value chains for these commodities. Research conducted at ICRIER can be of help if the government decides to take the first step enunciated in the draft policy. Eleven commodities — marine products, rice, meat, spices, cotton, fresh fruits and vegetables, sugar, coffee, groundnut, oilmeals and cashews — comprised more than 80 per cent of the country’s agri-export basket in 2016-17. Our study of 10 years’ data pertaining to 70 per cent of India’s agricultural output (20 commodities), shows that most crops were globally price-competitive in most years. However, since 2013-14, many of these commodities lost out on competitiveness, due to a fall in global prices. But it is not just price competitiveness that restricts our exports; the biggest hurdle comes from uncertain domestic marketing and trade policies. The inherent “consumer bias” in these policies makes the trading environment unstable and unpredictable. Any rise in domestic prices almost immediately leads to the imposition of market restrictions. Exports are restricted through the use of minimum export prices and bans while the Essential Commodities Act is used to regulate private participation. This harms India’s image of a reliable supplier of agri-products and ensures that the country does not get the best price for its exports. This consumer bias in policy must be redressed and a balance should be struck between meeting the needs of food-insecure consumers and income-insecure farmers. The first change that is required pertains to mindsets. Instead of suppressing market prices for farmers to support consumers, the government should protect them through targeted unconditional income transfers. Restricting markets and compensating farmers through higher MSPs based on the new formula (cost A2+FL+50 per cent) will be an inflationary and unsustainable solution to the woes of the country’s agriculturists. It is likely to hit agri-exports adversely, especially rice and cotton. The exports will become uncompetitive. Second, policymakers should support agri-exports while ensuring environmental sustainability. While marine products, meat, oilmeals, groundnuts, cotton, spices, fruits and vegetables do not pose environmental problems, exports of rice must be properly assessed. 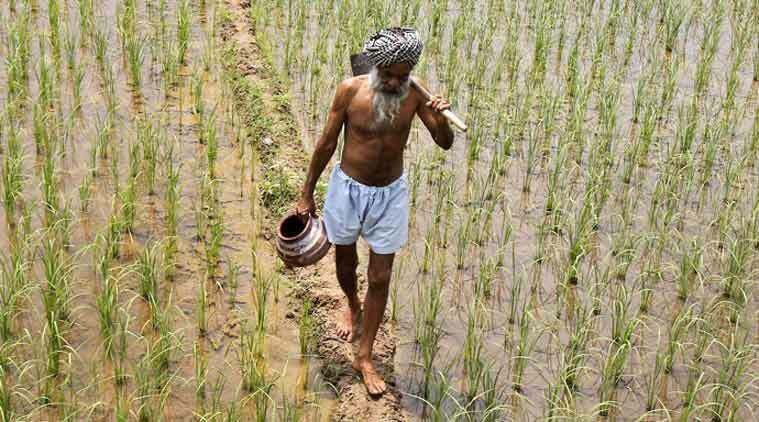 Cultivating one kg of rice in Punjab or Haryana needs about 5,000 litres of irrigation water. This is drawn from underground and has led to a drastic fall in the groundwater table by 70 to 110 cms/year. Exporting large quantities of common rice from this region is akin to exporting billions of cubic meters of water. The best way to correct this would be to gradually phase-out power and irrigation subsidies, and replace them with a direct income support to farmers, while letting the prices of power and water reflect its true value. Third, the government must develop efficient global value chains and liberalise land lease markets across all states. It should encourage contract farming on a medium- to long-term basis. Exporters and processors must be encouraged to buy directly from farmer-producer organisations (FPOs), bypassing the inefficient APMCs. Major investments are needed at the back-end to create infrastructure for global and domestic value chains, ranging from produce aggregation to its sorting and grading, packaging, storing and linking the hinterlands to ports for export markets. The private sector can be an effective player in creating such value chains, but it needs to be enabled by institutional reforms. These investments could have a multiplier effect on the rural economy. Most of these reforms come under the jurisdiction of state governments. With the BJP holding office in more than 20 states, this is Modi’s moment to reform agri-markets in one go. If the government can usher in these changes, agri-exports will rise and so will farmers’ incomes. But whether they touch the $60 billion mark or the $100 billion target by 2022-23 will depend on how wide-ranging the reforms are and how efficient their implementation is. The government’s record so far has been not very promising.